It’s probably not the most important thing but Google is improving the user interface of their wildly popular mapping service Google Maps. Personally, I’m quite satisfied with the very first Google Maps, getting a bird’s eye view of the entire world was good enough for me. Apparently, many people still get lost even with satellite photos of a place and need street names, driving directions and street view. I don’t blame them and I’m also glad that Google made Maps complete with its current features, it does come in handy from time to time. Anyway, the first thing they changed with Maps was their mascot Pegman. Well, not exactly changed, they got him out of the Street View feature and onto the the main map, right on top of the magnification bar. Also the magnification bar and the navigation buttons also got a redesign, now more similar to the Google Chrome’s theme, minimal, blue and white. To enter Street View, drag Pegman to a street (or just keep zooming in all the way, and the lowest zoom level is now Street View imagery). 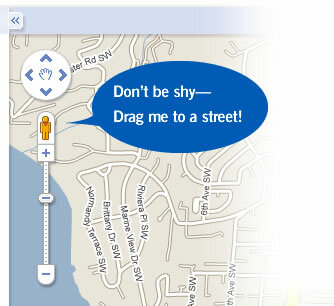 Tip: if you hold Pegman over a location for a second, you’ll see a preview of what it looks like. Moreover, Street View can now be viewed in a split screen layout with the entire map on the other screen. This gives the user both a street view and a bird’s eye view to keep his direction. Finally, Pegman gets some new skins, just for fun.